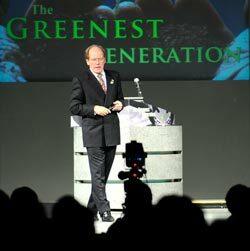 Dr. Pearse Lyons is the founder and the President of Alltech. This is his show and it is quite a show. I’ll have more on that later. I think I heard someone say there were less than a hundred people at the first Alltech Symposium. The fact that we’re near 1,700 here is a testament to how well marketing by education has worked for him. The photo is courtesy of Alltech photographer Tim Webb.